I have only just returned to my desk in Warsaw after what has been the final and certainly most exciting of all the research trips associated with my recently completed biography of my great uncle, the glamorous concert pianist Edward Cahill (1885-1975). One of his Swiss patrons, Helen Sieger, used to come to this place then known as Arsenheilbad Val Sinestra from their residence in Monaco for 'a cure' in the 1960s and I believe 'Uncle Eddie' may well have also visited it once. I was the first Australian ever to stay there as a guest. The great thing about writing books, particularly biographies, is the long process of exploration and discovery as one travels whilst physically and intellectually assembling the chosen subject. Then follows the labour of writing, editing and galvanising a publisher's interest in a somewhat esoteric subject. This work has taken me 5 years so far. The book itself will come as rather an anticlimax. As a result of this journey I will be able to add some excellent further commentary to the existing section before publication. I motored the long 3,100 kms round trip from Warsaw in my now ageing 2004 Peugeot 307 CC cabriolet (not without electronic incidents) through Poland, Germany, Austria, Switzerland and the Czech Republic. As I have only been back two days after three weeks away and have hundreds of photographs to sort thorough, the washing of piles of clothes, looking at the entries in my journal....all the dull stuff of a once bohemian but now domesticated bourgeois, please be patient for the 'thrilling details' which will inevitably follow. 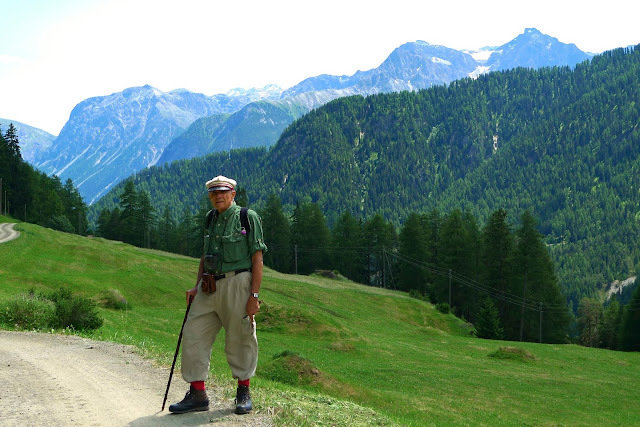 On this tour I decided on two different routes to and from Val Sinestra. 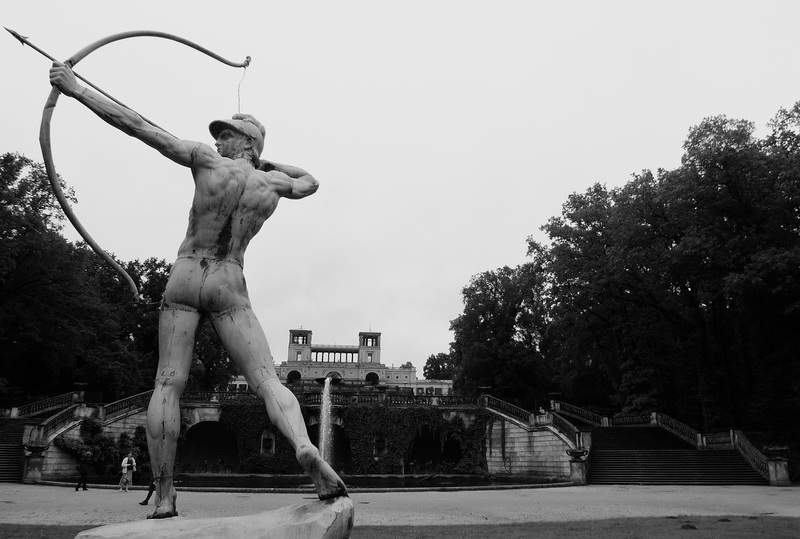 I had visited Potsdam on a previous research trip in 2011 and taken in the major sights, visiting the superb Sanssouci Palace. Eddie and Sabine’s own concert was given not in Berlin but in this exquisite location. 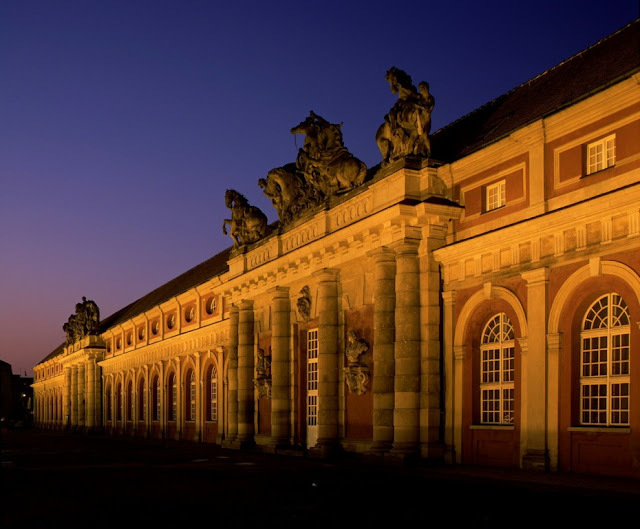 They spent the late spring afternoon of June wandering in the sun like many young other lovers in the monumental park laid out by Frederick the Great (Friedrich II), the King of Prussia. The ensemble is an unsurpassed marriage of landscape and architecture created by a cultured, private figure of the Enlightenment. Hitler idolised Frederick and even hung a portrait of the benevolent monarch above his desk. Characteristic of the man, Frederick is now buried beside his hounds in the gardens just outside the palace in a simple grave plot without decoration. The architecturally modest yet sumptuously decorated palace interior delighted the lovers, especially the Rococo Music Room where they performed. Eddie felt a singular sympathy with Frederick the Great. The king had been treated cruelly by his father , the obsessively militaristic Frederick William I. His son simply wanted to study music and learn to play the transverse flute. Dr Charles Burney, the urbane yet critical English music historian, had a high opinion of his playing when he heard him in Berlin in 1772. He wrote ‘his embouchure was clear and even, his finger brilliant, and his taste pure and simple’. The paternal accusations directed at Frederick of betraying ‘effeminate, dissolute and unmasculine preoccupations’ had a painfully familiar ring for Eddie. Of course his father did not beat him in public with a cane or force him to watch the beheading by sword of his best friend as did the psychotic militarist Frederick William. On this occasion I decided to visit the city itself on this particularly hot day. The immaculately restored example of German Classicism known at the Nikolaikirche (St. Nicholas Church) and other buildings in the Alte Markt make a fine ensemble. The beautiful architectural unity is disrupted by the customary communist anti-aesthetic structures, a nasty and unsympathetic gesture of defiance, languishing in decay. I had always wanted to visit the Filmmuseum which is situated in the imposing former royal stables. I spent some hours there watching rather more obscure films in this genre as well as familiar films by Fritz Lang, Georg Pabst and F.W. Murnau. German Expressionism in poetry, art (the Die Brücke movement) and film had fascinated me as a young man. 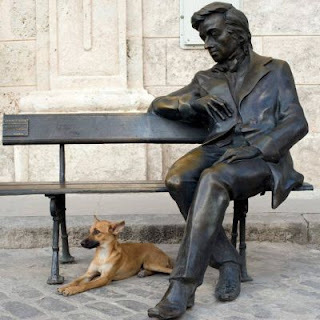 This movement together with the French Symbolist poetry of Mallarme influenced my developing developing writing style. I wondered how Eddie Cahill (my 'Uncle Eddie') would have accompanied such films during his period in the travelling silent cinema travelling through the Australian outback. The exhibits concentrate on German Expressionist films and the history of the famous Babelsberg film studios. Out of the centre of the city to Schloss Cecilienhof, the mock Tudor country house built during the Great War for Crown Prince Wilhelm (1882-1951) and his wife Cecilia of Mecklenburg-Schwerin (1886-1954). The historic meeting rooms of the Potsdam Conference of 1945 dominate the interesting interiors. 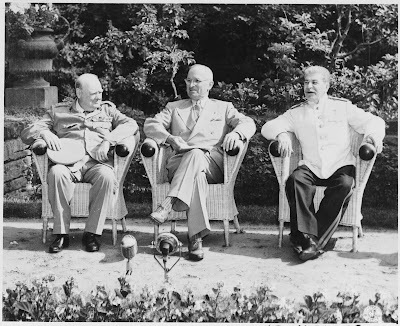 Fascinating detailed material and photographs of the distinct activities and culture of the various Allied delegations have been assembled in he lead up to the signing on August 2, 1945. 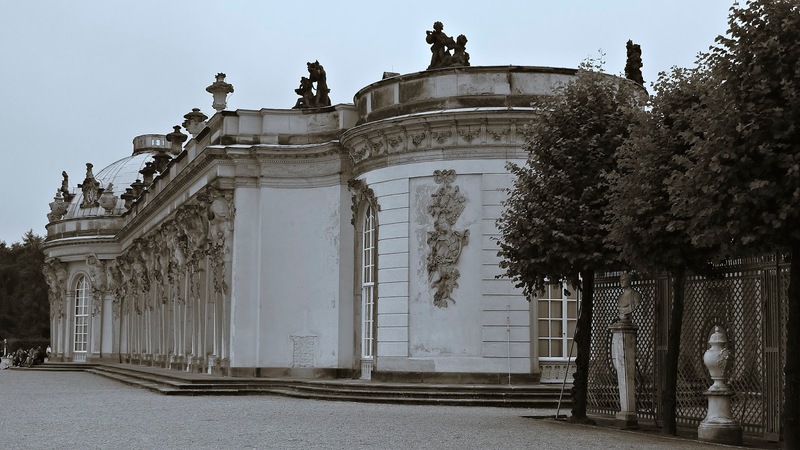 Not far from here but seldom visited is the elegant Marmorpalais (Marble Palace). Built in the Neuer Garten by Konrad von Gontard and converted into a summer residence for Friedrich Wilhelm II by Langhans (1744-97). I was taken on a long detailed private tour of the apartments. 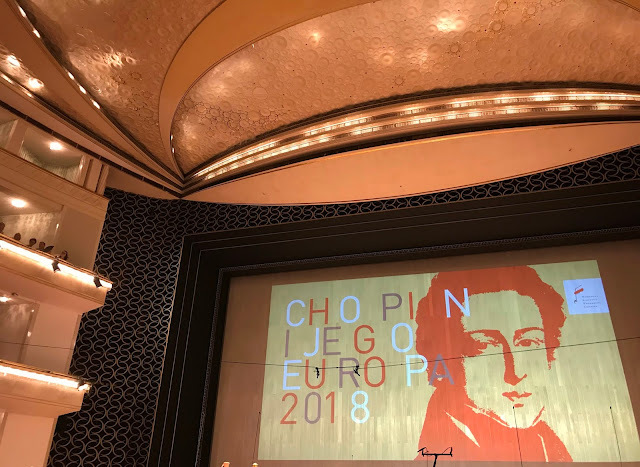 [I have been covering the 70th Chopin International Music Festival on my internet journal. It took up over a week of work and effort. Unfortunately at the small spa town of Duszniki Zdroj in Poland where the festival was held I caught a mysterious virus or infection probably from food and which I am still recovering from.